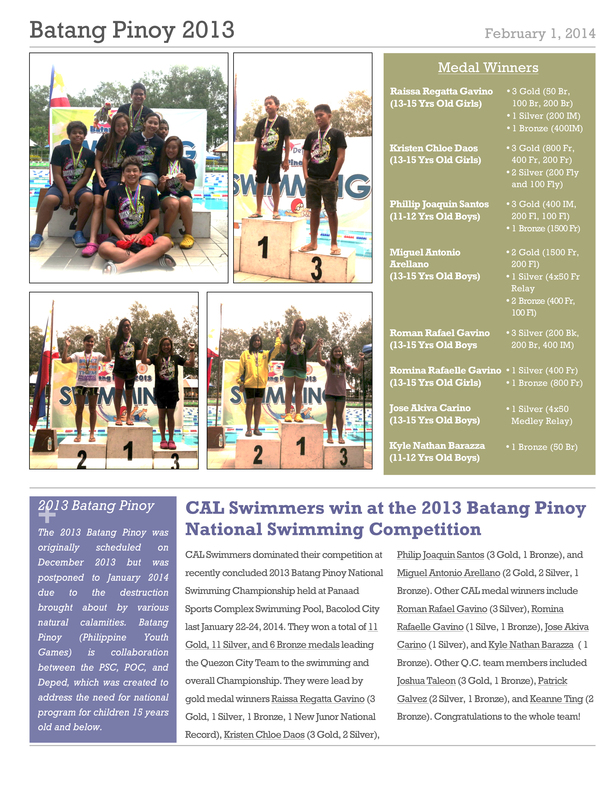 They were lead by gold medal winners Raissa Regatta Gavino (3 Gold, 1 Silver, 1 Bronze, 1 New Junor National Record), Kristen Chloe Daos (3 Gold, 2 Silver), 2 Philip Joaquin Santos (3 Gold, 1 Bronze), and Miguel Antonio Arellano (2 Gold, 2 Silver, 1 Bronze). Other CAL medal winners include Roman Rafael Gavino (3 Silver), Romina Rafaelle Gavino (1 Silve, 1 Bronze), Jose Akiva Carino (1 Silver), and Kyle Nathan Barazza ( 1 Bronze). Other Q.C. team members included Joshua Taleon (3 Gold, 1 Bronze), Patrick Galvez (2 Silver, 1 Bronze), and Keanne Ting (2 Bronze). Congratulations to the whole team!